Day of rest for the men. Edgar came to discuss German concession. (1) Guards stay at Tell Amarna and Tonnoh until further orders. (2) Guards to be removed from Maghagha (Karara). (3) Austrian guards taken over by me and Austrian excavations to be guarded by me along with my own. 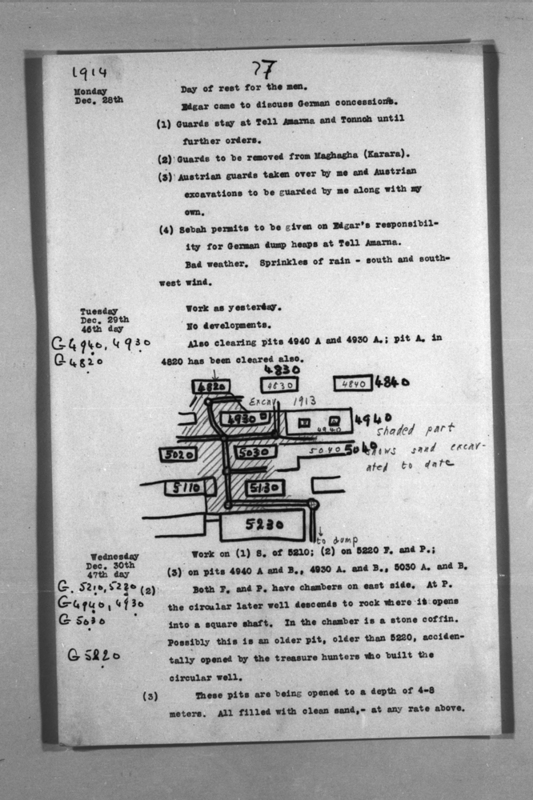 (4) Sebah permits to be given on Edgar's responsibility for German dump heaps at Tell Amarna. Bad weather. Sprinkles of rain - south and southwest wind. Also clearing pits G 4940 A and G 4930 A, pit A in G 4820 has been cleared also. Both F and P have chambers on east side. At P the circular later well descends to rock where it opens into a square shaft. In the chamber is a stone coffin. Possibly this is an older pit, older than G 5220, accidentally opened by the treasure hunters who built the circular well. Pits G 4940 A and B, G 4930 A and B, G 5030 A and B. These pits are being opened to a depth of 4 - 8 meters. All filled with clean sand, at any rate above. Remarks Egyptologist and Greek scholar; Acting Director General of the Department of Antiquities. Nationality and life dates from Who was Who in Egyptology.